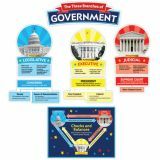 Help students understand how the U.S. government works with this visual tool that explains the three branches of government. Features a Checks and Balances poster to show how the branches interrelate. Includes photos of the White House, the U.S. Capitol, and the Supreme Court. Gallopade has created the Alabama Decorative Set to make shopping easier for you AND at a fantastic price! 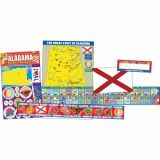 The Alabama Decorative Set has seven decorative products including bulletin boards, borders, nameplates, a map, a big timeline, and a giant coloring poster. Great for the classroom, home or office. Brighten your classroom and teach students about their state with Alabama Borders for Bulletin Boards! The Alabama Borders feature the Alabama official state tree, bird, flag, seal, and other symbols. Borders are 3” wide and 32' in total length. Students can learn the state tree, bird, flag, seal, and other symbols of Alabama right at their desk! State-specific nameplates will add pizzazz to your classroom decor and make learning about Alabama fun! Decorate your walls with this 11” x 17” Alabama Flag Poster. The Alabama Flag Poster is printed on high quality, heavy, gloss card stock with a full bleed and ready to be framed. The 11” X 17” Alabama State Map includes major cities, rivers, map legend of the states various industries, landmarks and lots more. Perfect for decorating your room, doors, and bulletin boards! Great for building map literacy! Decorate your walls, doors and windows with this 22” x 68” Alabama Giant Coloring Poster. The Alabama Giant Coloring Poster now includes 4 non-toxic crayons. The Alabama Giant Coloring Poster is a creative way for kids to learn about Alabama. It is a great project for one child to color or for an entire group at one time. Gallopade has created the Alaska Decorative Set to make shopping easier for you AND at a fantastic price! The Alaska Decorative Set has six decorative products including bulletin boards, borders, nameplates, a map, a big timeline, and a poster. The Alaska Decorative Set is discounted approximately Great for the classroom, home or office. 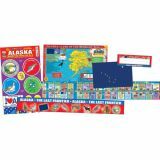 Brighten your classroom and teach students about their state with Alaska Borders for Bulletin Boards! The Alaska Borders feature the Alaska official state tree, bird, flag, seal, and other symbols. Borders are 3” wide and 32' in total length. Students can learn the state tree, bird, flag, seal, and other symbols of Alaska right at their desk! State-specific nameplates will add pizzazz to your classroom decor and make learning about Alaska fun! Decorate your walls with this 11” x 17” Alaska Flag Poster. The Alaska Flag Poster is printed on high quality, heavy, gloss card stock with a full bleed and ready to be framed. Gallopade has created the Arizona Decorative Set to make shopping easier for you AND at a fantastic price! 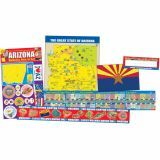 The Arizona Decorative Set has seven decorative products including bulletin boards, borders, nameplates, a map, a big timeline, and a giant coloring poster. Great for the classroom, home or office. Brighten your classroom and teach students about their state with Arizona Borders for Bulletin Boards! The Arizona Borders feature the Arizona official state tree, bird, flag, seal, and other symbols. Borders are 3” wide and 32' in total length. Students can learn the state tree, bird, flag, seal, and other symbols of Arizona right at their desk! State-specific nameplates will add pizzazz to your classroom decor and make learning about Arizona fun! Decorate your walls with this 11” x 17” Arizona Flag Poster. The Arizona Flag Poster is printed on high quality, heavy, gloss card stock with a full bleed and ready to be framed. The 11” X 17” Arizona State Map includes major cities, rivers, map legend of the states various industries, landmarks and lots more. Perfect for decorating your room, doors, and bulletin boards! Great for building map literacy! Decorate your walls, doors and windows with this 22” x 68” Arizona Giant Coloring Poster. The Arizona Giant Coloring Poster now includes 4 non-toxic crayons. The Arizona Giant Coloring Poster is a creative way for kids to learn about Arizona. It is a great project for one child to color or for an entire group at one time. Gallopade has created the Arkansas Decorative Set to make shopping easier for you AND at a fantastic price! The Arkansas Decorative Set has six decorative products including bulletin boards, borders, nameplates, a map, a big timeline, and a poster. Great for the classroom, home or office. 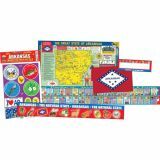 Brighten your classroom and teach students about their state with Arkansas Borders for Bulletin Boards! The Arkansas Borders feature the Arkansas official state tree, bird, flag, seal, and other symbols. Borders are 3” wide and 32' in total length. Students can learn the state tree, bird, flag, seal, and other symbols of Arkansas right at their desk! State-specific nameplates will add pizzazz to your classroom decor and make learning about Arkansas fun! Decorate your walls with this 11” x 17” Arkansas Flag Poster. The Arkansas Flag Poster is printed on high quality, heavy, gloss card stock with a full bleed and ready to be framed. Gallopade has created the California Decorative Set to make shopping easier for you AND at a fantastic price! 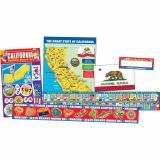 The California Decorative Set has seven decorative products including bulletin boards, borders, nameplates, a map, a big timeline, and a giant coloring poster. Perfect for decorating your walls, windows, hallways, doors and more. Great for the classroom, home or office. Brighten your classroom and teach students about their state with California Borders for Bulletin Boards! The California Borders feature the California official state tree, bird, flag, seal, and other symbols. Borders are 3” wide and 32' in total length. Students can learn the state tree, bird, flag, seal, and other symbols of California right at their desk! State-specific nameplates will add pizzazz to your classroom decor and make learning about California fun! Decorate your walls with this 11” x 17” California Flag Poster. The California Flag Poster is printed on high quality, heavy, gloss card stock with a full bleed and ready to be framed. The 11” X 17” California State Map includes major cities, rivers, map legend of the states various industries, landmarks and lots more. Perfect for decorating your room, doors, and bulletin boards! Great for building map literacy! Decorate your walls, doors and windows with this 22” x 68” California Giant Coloring Poster. The California Giant Coloring Poster now includes 4 non-toxic crayons. The California Giant Coloring Poster is a creative way for kids to learn about California. It is a great project for one child to color or for an entire group at one time. Gallopade has created the Colorado Decorative Set to make shopping easier for you AND at a fantastic price! The Colorado Decorative Set has six decorative products including bulletin boards, borders, nameplates, a map, a big timeline, and a poster. Perfect for decorating your walls, windows, hallways, doors and more. Great for the classroom, home or office. 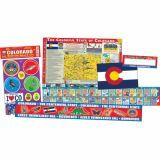 Brighten your classroom and teach students about their state with Colorado Borders for Bulletin Boards! The Colorado Borders feature the Colorado official state tree, bird, flag, seal, and other symbols. Borders are 3” wide and 32' in total length. Students can learn the state tree, bird, flag, seal, and other symbols of Colorado right at their desk! State-specific nameplates will add pizzazz to your classroom decor and make learning about Colorado fun! Decorate your walls with this 11” x 17” Colorado Flag Poster. The Colorado Flag Poster is printed on high quality, heavy, gloss card stock with a full bleed and ready to be framed. Gallopade has created the Connecticut Decorative Set to make shopping easier for you AND at a fantastic price! 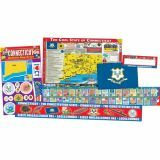 The Connecticut Decorative Set has six decorative products including bulletin boards, borders, nameplates, a map, a big timeline, and a poster. Perfect for decorating your walls, windows, hallways, doors and more. Great for the classroom, home or office. Brighten your classroom and teach students about their state with Connecticut Borders for Bulletin Boards! The Connecticut Borders feature the Connecticut official state tree, bird, flag, seal, and other symbols. Borders are 3” wide and 32' in total length. Students can learn the state tree, bird, flag, seal, and other symbols of Connecticut right at their desk! State-specific nameplates will add pizzazz to your classroom decor and make learning about Connecticut fun! Decorate your walls with this 11” x 17” Connecticut Flag Poster. The Connecticut Flag Poster is printed on high quality, heavy, gloss card stock with a full bleed and ready to be framed. Gallopade has created the Delaware Decorative Set to make shopping easier for you AND at a fantastic price! The Delaware Decorative Set has six decorative products including bulletin boards, borders, nameplates, a map, a big timeline, and a poster. Perfect for decorating your walls, windows, hallways, doors and more. Great for the classroom, home or office. Brighten your classroom and teach students about their state with Delaware Borders for Bulletin Boards! The Delaware Borders feature the Delaware official state tree, bird, flag, seal, and other symbols. Borders are 3” wide and 32' in total length. Students can learn the state tree, bird, flag, seal, and other symbols of Delaware right at their desk! State-specific nameplates will add pizzazz to your classroom decor and make learning about Delaware fun! Decorate your walls with this 11” x 17” Delaware Flag Poster. The Delaware Flag Poster is printed on high quality, heavy, gloss card stock with a full bleed and ready to be framed. Gallopade has created the Florida Decorative Set to make shopping easier for you AND at a fantastic price! 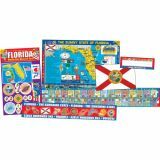 The Florida Decorative Set has six decorative products including bulletin boards, borders, nameplates, a map, a big timeline, and a poster. Perfect for decorating your walls, windows, hallways, doors and more. Great for the classroom, home or office. Brighten your classroom and teach students about their state with Florida Borders for Bulletin Boards! The Florida Borders feature the Florida official state tree, bird, flag, seal, and other symbols. Borders are 3” wide and 32' in total length. Students can learn the state tree, bird, flag, seal, and other symbols of Florida right at their desk! State-specific nameplates will add pizzazz to your classroom decor and make learning about Florida fun! Decorate your walls with this 11” x 17” Florida Flag Poster. The Florida Flag Poster is printed on high quality, heavy, gloss card stock with a full bleed and ready to be framed. Gallopade has created the Georgia Decorative Set to make shopping easier for you AND at a fantastic price! The Georgia Decorative Set has six decorative products including bulletin boards, borders, nameplates, a map, a big timeline, and a poster. Perfect for decorating your walls, windows, hallways, doors and more. Great for the classroom, home or office. Brighten your classroom and teach students about their state with Georgia Borders for Bulletin Boards! The Georgia Borders feature the Georgia official state tree, bird, flag, seal, and other symbols. Borders are 3” wide and 32' in total length. Students can learn the state tree, bird, flag, seal, and other symbols of Georgia right at their desk! 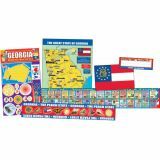 State-specific nameplates will add pizzazz to your classroom decor and make learning about Georgia fun! Decorate your walls with this 11” x 17” Georgia Flag Poster. The Georgia Flag Poster is printed on high quality, heavy, gloss card stock with a full bleed and ready to be framed.